Sensor Instruments GmbH: When cartons, magazines, or single sheets are packed, it must be ensured that each package has the correct number of items. In most cases such material is transported in shingled form before, as with magazines, newspapers or advertising prints, it is packed by means of a compensating stacker. Depending on the thickness of the individual copies and on their transport speed (up to 10m/s) the shingled stream may have differing heights in this process. Especially with cartons that have an individual thickness of e.g. 2mm the height difference of the shingled stream may be up to 100mm. Furthermore, the shingle distance from copy to copy may also differ (sometimes up to 50% with the same material). With single sheets the sheet thickness is another challenge for the detection system, because especially in the Asiatic region there may be paper thicknesses that already start with 50µm. For the detection of copies it must furthermore be considered that these in most cases are in printed form, and often in high-gloss. For meeting the high requirements concerning counting accuracy under the above-mentioned conditions, the RED series that is used here operates with the principle of edge detection in reflected-light operation. With a maximum scan frequency of typ. 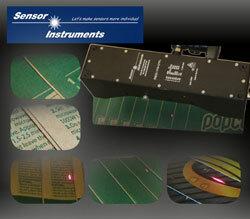 100kHz the RED-110-L edge detector is excellently suited for accurate copy counting, even at highest transport speeds. A power-controlled focussed red laser line prevents incorrect counting results even in case of printed copy surfaces with changing surface structure (with respect to gloss, color and roughness). Additional software measures such as the so-called dynamic dead time and the variable switching hysteresis effectively suppress multiple counting of a copy if there are several edges. High-precision evaluation allows the detection of edges starting from a thickness of 30 µm. The standard model has a typical operating range of 90mm to 130mm, and the RED-110-L-XL that is optimised for the detection range has a typical operating range of 60mm to 200mm. The detectors can be comfortably parameterised with the RED Scope PC software, and the real-time digital scope that is integrated in the monitoring software considerably facilitates the setup process.